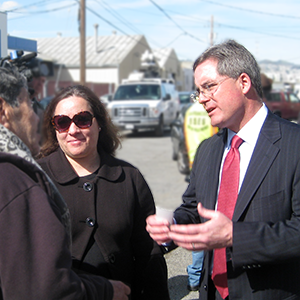 Deputy City Attorney Yvonne Meré, lead counsel in the Trinity Place investigation, with City Attorney Dennis Herrera at a neighborhood event. SAN FRANCISCO (Aug. 6, 2015)—A major residential development project, hailed as “the Miracle of Mission Street” for overcoming years of opposition with promised benefits including 360 new apartments designated as rent-controlled, is facing scrutiny over apparently unlawful uses of residential dwellings for short-term tourist accommodations. City Attorney Dennis Herrera publicly acknowledged his office’s investigation into the potentially unlawful and unauthorized uses at 1188 and 1190 Mission Street in a letter delivered yesterday to Trinity Place developer Angelo Sangiacomo and counsel. According to the letter, Herrera’s investigation found that at least 16 rent-controlled apartments, all intended as replacement units for residents at 1188 Mission Street, were instead leased to a single individual for the apparent purpose of marketing them as short-term tourist rentals. Another seven apartments in neighboring 1190 Mission Street were similarly leased to the same person for concurrent and overlapping periods, with evidence indicating those units were also then rented to tourists for short-term stays. Although apartments at 1190 Mission Street are not subject to rent-control, the required use of dwellings in both buildings is residential housing, under terms of the 2007 development agreement between Sangiacomo and the City and related City approvals. The findings corroborate other evidence Herrera identified in his office’s investigation that Trinity Place dwellings have been marketed for transient occupancy as “The SOMA Suites Hotel,” an unincorporated and apparently unregistered entity that identifies its location to prospective hotel guests as 1188 Mission Street in San Francisco. Herrera’s letter requests the full cooperation of Sangiacomo and his agents in his office’s investigation, to thoroughly account for the uses of the rent controlled units and other residential units authorized under the Trinity Place development agreement since its execution. The letter specifically requests documents, contracts, leases and other information detailing financial relationships among Sangiacomo’s business interests and individuals and companies identified in Herrera’s investigation that appear to be involved in the short term rental violations.